Have you ever fantasized about living on Walt Disney World Disney property? Sure it’s a great experience to stay at one of several accommodations located throughout the Walt Disney World property in Orlando but what if you could live there on a permanent basis? Now for the first time in history, that opportunity is available with a new luxury residential community Disney is building – Golden Oak at Walt Disney World. 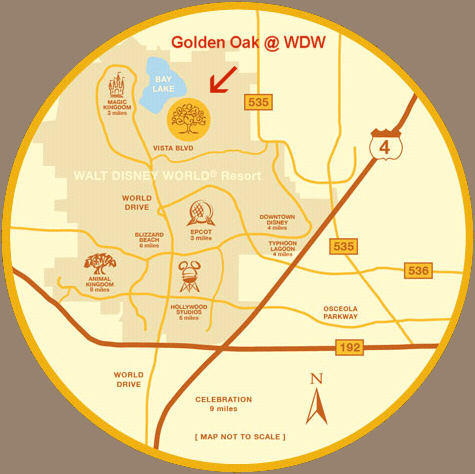 Golden Oak is planned to be a luxury residential resort community within the Walt Disney World Resort, designed by Walt Disney Imagineering, and owned and operated by a newly formed Disney subsidiary, Golden Oak Realty. It is being developed in the Magic Kingdom Resort Area near Bay Lake with the first few home sites to be available for purchase in late 2010 and a projected for completion date in 2011. The community will include approximately 450 lavish custom single-family homes and estates priced between $1.5 million and $8 million, featuring themes such as Spanish, Mediterranean and Colonial. The homes will be spread out amongst four gracefully arranged neighborhoods – Carolwood, Carolwood Reserve, Silverbrook and Kimball Trace. Residents will receive benefits such as a private concierge, VIP access to Walt Disney World parks, home maintenance and more. If that was not enough, home owners will have access to certain features at the nearby planned Four Seasons Resort Orlando (also within the Walt Disney World Resort). These include a full-service spa, restaurants, facilities for private events and an 18-hole golf course designed by Tom Fazio. With such a limited number of homes and prices exceeding the range that most can afford, this will definitely be a community for the elite. However, if you have the means and are fortunate enough to be selected from the Priority Reservation List, Golden Oak offers a dream-come-true opportunity to never have to leave the magic of a Disney park/resort experience. For more information, visit the official site of Golden Oak at Walt Disney World. I would love to live just in Celebration, but even that is way out of my price range. Golden Oaks, would be fun, but my goal is Celebration if I can get my career in line.